Polytechnic students please don't worry of your studies and preparations of exams because this site is there for you. Its a time for you now to just cheer because now this blog will provide the the total solved syllabus of FIRST YEAR MATHS including the total solved sums and problems. Students don't have to go anywhere as they will get all their problems solved for first year maths at one place i.e., is only on this site and nowhere else. All functions, including trigonometry functions, can be described as being even, odd, or neither. A function is said to be odd if and only if f(-x) = - f(x) at all values of x and is symmetric with respect to the origin. Similarly, function is even if and only if f(-x) = f(x) at all values of x and is symmetric to the y axis. 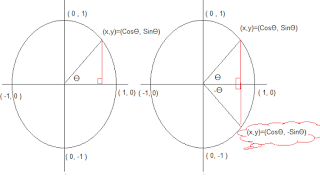 It is helpful to know if a function is odd or even when we are trying to simplify an expression when the variable inside the trigonometric functions are negative. We can see that for both Ө and –Ө in the above given figure. 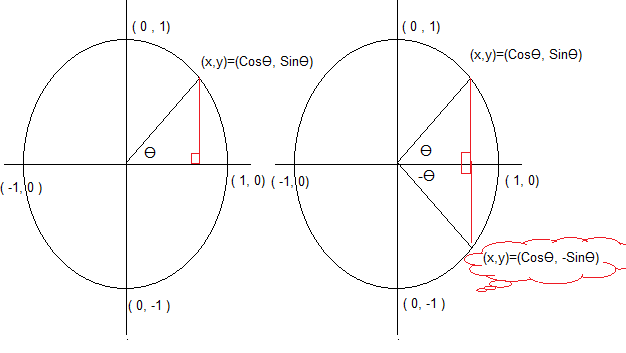 Value of “x” remains same, Hence Cos(Ө) = Cos(-Ө). If you find any doubts please free to ask them in the comment section, We would be happy to reply with solution ASAP. Polytechnic Master. Simple theme. Powered by Blogger.